PMBOK 6th Edition PDF is available for download to all PMI Members for free. 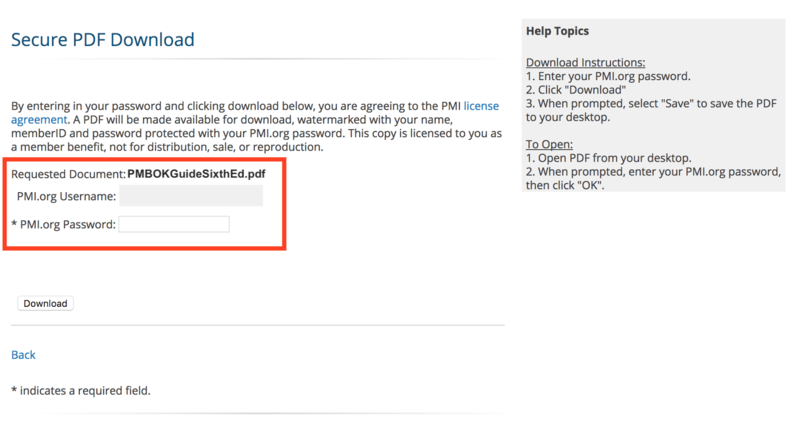 You need to login to the PMI website with your PMI user ID / password, to download the PMBOK Guide PDF. The PDF file is password protected and when you try to open it, it will prompt you for a password. In order to open the file, you will need to enter your PMI (www.pmi.org) password. Note: PMI User ID is different from your PMI Member ID (printed on your PMI membership card). A big change in the 6th Edition of the PMBOK® Guide is that it includes a complementary copy of the Agile Practice Guide. You’ll find the Agile Practice Guide appended to the end of the same PDF file that you’ll download for the PMBOK® Guide, 6th Edition. Click the Download button to get to the actual download page. On the download page, enter your PMI.org password. When prompted, select "Save" to save the PDF to your desktop. If you are serious about PMP Certification, I can help you get a free and 100% legal copy of the PMBOK® Guide, 6th Edition and also save $11 on your exam cost. Read 10 Benefits of PMI Membership to find out more. What format of PMBOK Guide do you prefer? 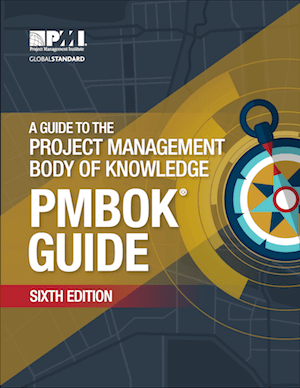 If you downloaded the PMBOK Guide, 6th Edition soon after its release but do not have the PMI membership to download the latest copy, you may want to download the errata file below. If you have any questions on this topic, post them as comments below. I didn't understand you properly. 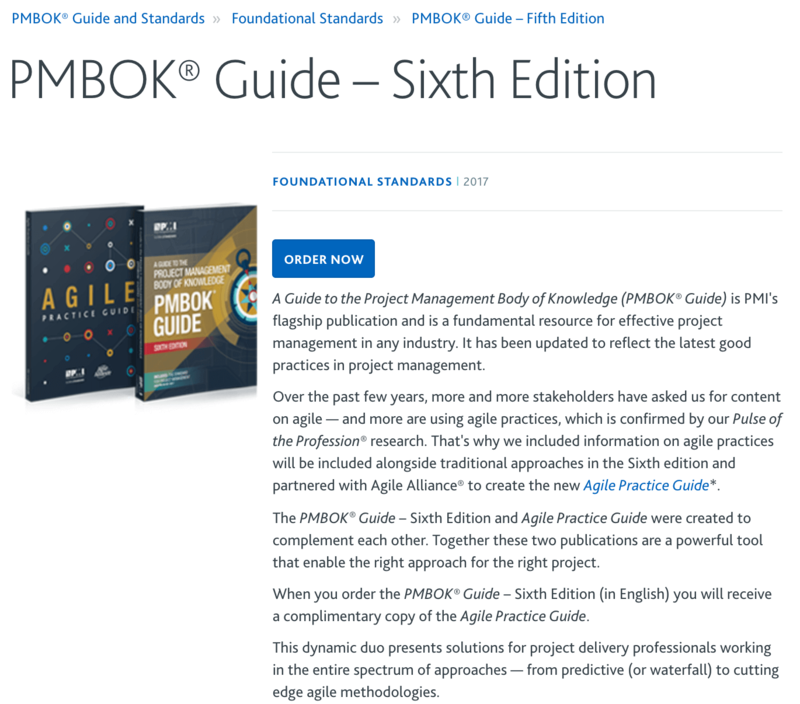 If you have the PMI ID, why don't you use the link (given in the post above) and download the PMBOK Guide 4th Edition directly from the PMI website? You already have 3rd edition why u want 4th edition better take PMBOK 6th Edition from any of the online provider. I have purchased a membership (Individual) from PMI on 12/16 and have received the PMI ID (online). When I try to access the link (PMI Library of Global Standards) in order to download PMBOK, it always saying ERROR: Access Denied. However, I am able to access MYPMI, where it clearly say my membership is valid until Dec 2010. I have contacted PMI regarding this and havent heard back from them yet. Are you aware about such situations for others anytime before? Is there a window period after membership and resource download (PMBOK)? Any insight on this would be helpful. Btw., Thanks for sending out the Prepcast coupons recently. I used the same and I am enjoying the learning. Since you just purchased PMI membership, there might be a slight lag in your account activation. Just try after a couple days. PMI customer care usually takes about 3 business days to respond, and my experience confirms this. Don't expect an instant response from them. Anyway, there's nothing to worry about. It would all work out fine. If you are the member and could not access member areas, call customer support and it would be done in 1-3 days. My friend had the same problem. I am unable to download a PDF Copy of the PMBOK. I have already signed up with PMI.ORG. Nobody can help you without knowing what the problem is. So either you describe the problem here or write directly to PMI support for help. I am interested in doing PMP certification but not sure from where and what study material should I get. That page will point you to other useful links. Hi, I have the latest pmbok in pdf version and I could access it using my PMI password. I am no longer a PMI member and I cannot access the pdf anymore. I have a doubt: is it due to a change in my password that I can't remember or simply the fact that I m not anymore PMI member so, I can just forget all the stuff they gave me access in the past? and finally, is there a way to be able to read my pdf copy of the document again? Thanks for the answer and merry christmas! I believe you need to be an active PMI member to access/download the PDF files. Usually I download the PDF files immediately after becoming a member. I suggest that you write to PMI customer support and check whether it's an issue with your account credentials or the membership has expired. Hope you have a great 2016 ahead. Oups, nevermind..I entered the password incorrectly and now it's working even if i m not anymore a pmi member. Thanks anyway and have a nice new year eve! Good to know that it works for you. But for the benefit of other readers, I just logged into my PMI account and confirmed that I couldn't access the PDF versions anymore because my membership had expired. So I'm pretty sure they take the access away once your membership expires (they may be giving some grace period) because I've confirmed this in the past too (I have been PMI member on and off for nearly 10 years). Members can log in to enjoy complimentary access to PDFs of the standards. I m interested in doing PMP certification. Would look forward for our guidance and for 5th edition of PMBOK. Please go through the post How to become a PMP in 6 Steps (linked in one of the previous comments). That will lead you to other resources to help you prepare. You'll get the PMBOK Guide once you sign up for the PMI membership, which you should do anyway to save on the exam fee. I am Naveen Kumar,completed B.tech with MBA and working in a xyz company . I'm very much interested about doing PMP certification course.But can you please suggest me how can it will help to my career. I put the question back to you. What makes you very interested in PMP? I may be able to advise further based on your response. I downloaded the PMBOK long back and forgot the password to open the PDF, where can I get the password to open the PDF? It should be the same password as the one for your PMI account at the time you downloaded it. If you still have PMI membership, then you can reset your account password, log in, and download the guide again. Another option is to write to PMI customer care and seek help from them. The link that you clicked was still pointing to the 5th edition. I’ve just fixed it. Try it again and it should work now. Thanks for reporting it. The PMBOK Guide now includes a complementary copy of the Agile Practice Guide also. So what you see is correct. Will this be an actual PDF that I can open from any device, markup, add comments etc? Or is it like a web version? Also, do i get to keep it even if I cancel my PMI membership after a year? Yes, it’s for you to keep after you’ve downloaded it even if your membership expires. I registered as a PMI member with the intend that I would be able to download the PMBOK 6th Edition pdf copy but very surprised that the whole document have bookmarks on every single page. I know it is not for distribution and will not do so but why should a member study from this free material that has bookmarks all over it? The document is already password protected so why spoil a learners study guide by adding so many bookmarks. I completely understand your frustration. It is super annoying and directly interferes with the readability, and even more so for those using the guide to prepare for PMP or CAPM. But, don’t stop here. Reach out to PMI through various social media channels and let them know that it’s not done. 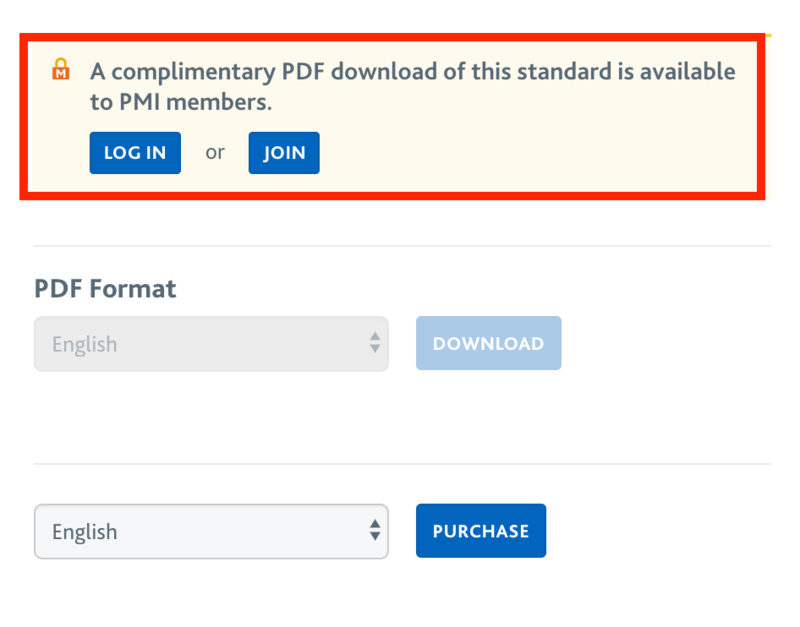 I am an existing PMI member but I do not see the complementary free link. Infact the only option I have is to purchase the book. Can you help share the pdf? Well in that case you should contact PMI customer care and get the issue resolved, and not look for someone to share a copy with you (something that would be illegal). When my PMI membership runs out, will I still be able to access the online copy of the PMBOK guide I have received with my membership? Will I be able to access updates as well? Or do I have to keep my membership active in order to have continuous access? Unfortunately, you’ll have to keep your membership active in order to receive updates.